Google Drive allows you to upload photos, videos, documents, and other files that are important to you. On sign-up you are given 15GB of free storage. Vuze (9.5 MB) v5.0 torrent downloader for Windows or Mac makes it easy for you to find torrents online, whether you are downloading torrents from a tracker site, from a buddy via magnet links, or anywhere else on the web. JDownloader v0.9581 is a free, open-source download management tool that makes downloading fast and easy. Users can start, stop or pause downloads, set bandwith limitations, auto-extract archives and much more. Suports Windows, Linux, and OS X. Siege is an http load testing and benchmarking utility. It was designed to let web developers measure their code under duress, to see how it will stand up to load on the internet. Supports most Unix-based systems. Code Compare 1.0 (126 KB) is a comparison and synchronization tool. The program will compare text, source code, XML files and directories; highlight the differences; then merge the files. Freeware for Windows. Floating Comments 1.0 (333 KB) WordPress plugin creates a form that follows you as you scroll down the page. You can easily post a comment at the bottom or top of the page. Available in five different languages. Freeware. Requires WordPress 3.0 or higher. uTorrent 3.1 (124 KB) is an easy to use BitTorrent Client. Features include global and per-torrent speed limiting, RSS auto-downloading, simultaneous downloads, a built-in scheduler, skin and proxy support, etc. Freeware for Windows 2K/ XP/ Vista/ 7. DownThemAll 2.0 is a download manager/accelerator Firefox add-on. You can easily download links and images from any webpage, pause and resume downloads at any time; and it increases your download speed by 4x, etc. Freeware. Requires Firefox browser. 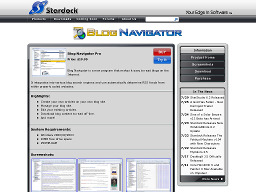 Blog Navigator (1.1 MB) is an easy-to-use program for browsing blog sites. Uses RSS feeds as its input and supports many different types of sites. Includes features for reading blogs offline, as well as putting different blog sites together to create customized browsing preferences. Freeware for Windows 98/ ME/ XP/ 2000. HTMLAsText (26 KB) is a utility that converts html documents to simple text files, by removing all html tags and formatting the text according to your preferences. Freeware for Windows. TrafficEmulator (340 KB ) generates IP/ ICMP/ TCP/ UDP traffic from clients to server to stress test servers, routers and firewalls under heavy network load. Small, fast and easy to use. Freeware for Windows 2000/ XP/ 2003. TV (1.0 MB) emulates regular television on your PC using high speed broadband. Watch hundreds (300+) of live worldwide channels. Freeware for all Windows versions. 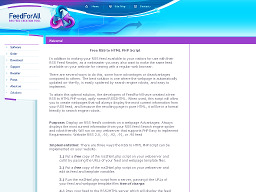 RSS2html (6.5 KB) is a PHP script that can convert RSS feeds to HTML. The rss2html.php script allows webmasters to display RSS feeds on their website. 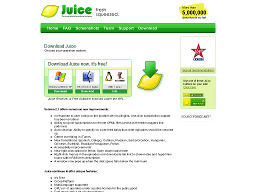 Juice (6.6 MB) is a podcast reader that can download and organize audio content from various online sources. Includes a content archive that you can choose from to get started. Add custom URLs or auto check for new content. 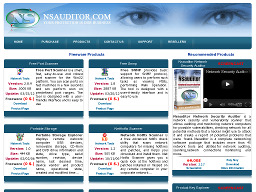 Freeware for Windows 2000/ XP, Mac OS/X.